The Sydney Morning Herald reports that Sydney is planning shared bike lanes/sidewalks along the busy College St. in the Central Business District as a part of their strategy to increase cycling by 500% over the next 10 years. 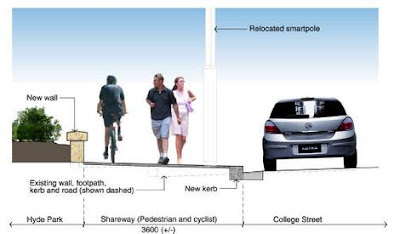 As you can see in the artist's rendering above, bikes will share the widened footpath with pedestrians. Councillor John McInerney, chair of the council's traffic committee, wants to "mirror the European experience". I think he should look up 'mirroring' in the dictionary. Sydney, apparently, is flush with cash compared to other Australian councils and yet THIS is what they come up with? I don't understand why they don't create separated bike lanes on the street, leaving the pedestrians alone, if they truly wish to 'mirror' us. Shared spaces like this will work in countries that are used to the bicycle in the urban landscape like Denmark, Holland, Germany, Belgium, Sweden, etc. And only in certain areas. In a city where people are still surprised to see a bicycle, it's a recipe for irritation and aggravation. By merely chucking the bicycle up onto the footpath, you are hardly elevating it to its rightful position as a respected and feasible form of transport. You're just marginalising cycling in a different way. While Sydney Cycle Chic exists, normal citizens on bikes aren't being given the chance to enjoy bicycle culture. If you want regular people to take to the bicycle, you have to invest in proper bike lanes. You have to respect the bicycle as an equal to the motorised traffic and afford it the appropriate infrastructure in the form of safe, separate bike lanes. It really is the only way to encourage new cyclists to use the bike. The shared space in Sydney won't even have painted lines between the bikes and the pedestrians. Here in Copenhagen we have just opened up the long promenande along The Lakes to bikes, where it was pedestrians only previously. The bright white line is a must, even in this bicycle-saturated city. With all that said, Sydney has plans for separated bike lanes elsewhere in the city, having opted for 'bi-directional' lanes, as you can read in the article. They are spending $70 million AUD over four years on a cycling strategy that includes 55 km of dedicated separated bike paths. Construction has begun on the city's first bi-directional, separated bike path in King Street but plans are being revised for Bourke Street after residents complained about the removal of trees. Now, excuse me, but aren't trees usually planted on footpaths? It's time for politicians in Sydney to take their plans seriously by removing car lanes and replacing them with bike lanes. There is no need to chop down trees. There will be whiners when the odd car lane is removed, but as we've seen all round the world, business will increase for shopkeepers and property values will rise for residents if proper bike infrastructure is put into place. Australia recently overtook the Fattest Nation on Earth title from the US. Helmet laws have paralysed cycling. Politicians need to be bolder if they are serious about increasing urban cycling.